The first rule with any fruit or pod-producing vegetable is to keep up with the picking. Leave those courgettes to swell into marrows and you’ll inadvertently slow the initiation of new flowers and fruits. Beans will also stop producing more pods if the existing ones are left to ripen to biological maturity – by forming seeds, the plants will have completed their lifecycle, and will have no reason to continue flowering. Check plants every couple of days and remove fruits and pods before they get too large or overripe. And if you’re heading away from home for more than a week, encourage your neighbours to harvest them – they’ll get free food and you’ll come home to continued pickings! Don’t scrimp on feeding your crops. Continue watering a suitable organic liquid fertiliser on to hungry fruiting vegetables like tomatoes, peppers and aubergine. Feeding plants costs money but does mean more fruits of better quality, so the investment is well worth it. Or why not make your own liquid feed from fast-growing, nutrient-rich plants such as comfrey? Later on in the season stragglers can be encouraged to keep producing for a week or two longer by adding the thermal comfort of a row cover such as horticultural fleece or plastic. 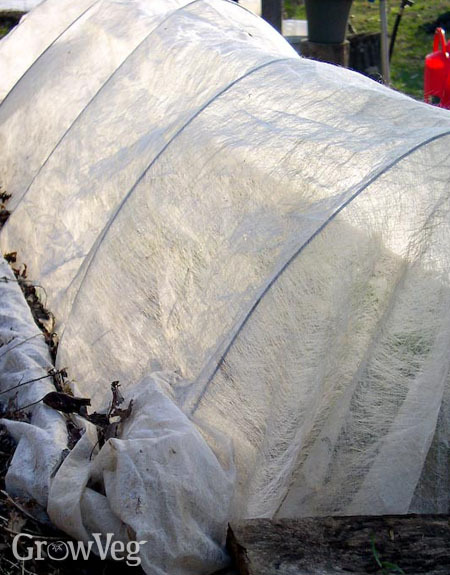 Remove covers during the day to enable pollination, then replace it in the evening to provide a little warmth and protection against lower temperatures.